Each post in the series presents real-world problems for which Men & Mice have solutions. A CTO of a global logistics company and your corporate network is diverse, due in large part to acquisitions, where segments are in cloud, co-located and in your own data centers. Your warehouses around the world have to run independently, to ensure there are no service or operations interruptions, even if cut off from the rest of the network. How do you consolidate and synchronize between on-prem and cloud networks, even when a location goes offline? A network administrator and your company is tapping into cloud infrastructure for the first time. You’re tasked with overseeing workload migration and establishing processes for orchestration. Where do you start? The Director of Infrastructure Services at an IoT company providing personalized services for users. Privacy is paramount, and your solution relies on heavy cloud usage — but utilizing virtual machines on-demand is slow and customers experience issues. You identify that your on-prem DNS is the bottleneck. From a business standpoint, the advantages of cloud services cannot be overstated. While attending Gartner IOCS London last week, we saw our vision validated. The overarching message to IT Infrastructure and Operations leaders was to modernize, diversify and synchronize. Further, AWS re:Invent, which we also attended, showcased Amazon’s focus on streamlining hybrid environments, which was great news for customers of Men & Mice Suite who capitalize on our compatibility with AWS and AWS Route 53, from an IPAM and DNS perspective respectively. The modern strategy in network is to align network architecture and operations with business logic and policy for more intelligent infrastructure. This means capitalizing on and properly integrating cloud resources into existing networks, and avoiding hidden and unexpected costs (“What is this $100,000 bill from our [cloud provider]? ?” --Philip Dawson, during Gartner IOCS London). Integrating is the hard part… or at least it used to be. We’re very much looking forward to continuing the conversation around hybrid cloud efficiencies and our leadership in DNS, DHCP and IPAM for complex hybrid networks at Gartner IOCS in Las Vegas this week. Every network management solution must include some kind of integration with cloud services. There’s a difference, however, between cloud-native integration at the core and compatibility as a feature or an afterthought. Worse, forcing customers to retrofit antiquated solutions into cloud services as a means of retaining a revenue model destined for extinction. Furthermore, compatibility with a range of cloud services (from AWS to Azure to others) is important: flexibility means little if it comes with a set of strings that lock your business in. You need portability. Your network will scale up, down, in and out faster than ever before. Adaptability is key. Plus, distributed resources and redundancy protect against DDoS and other failures. Men & Mice Suite is an overlay solution for core of IP infrastructure management. Its flexibility as an overlay above the entire network, regardless of platform and environment, extends beyond on-prem, into cloud services as well. Because the Men & Mice Suite handles network the same way, no matter the underlying setup or location, it’s especially suited to consolidate and synchronize, making management more efficient and automation easier. Further, its built-in reporting features (specifically audit trails) channel all network information from various resources through a central component, enabling quick, transparent data on what’s happening in your IP infrastructure and where. If a part of the network becomes isolated, for example, Men & Mice Suite will then seamlessly sync and update once reconnected. 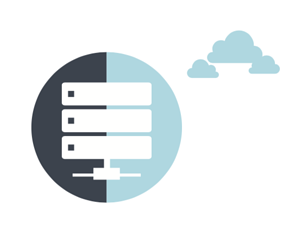 Another roadblock for business at the network level is incompatibility between cloud services. Each vendor organizes data differently, with different APIs, which creates a need for specialized personnel, support services and added costs and can make moving workloads to or across cloud infrastructure frustrating at best and impossible at worst. The Men & Mice Suite simplifies orchestration and automation through its reliable APIs, which are compatible with the best-in-class cloud services, even capitalizing on their cloud-native features. It utilizes the existing service features to pull valuable Cloud IPAM and DNS information into a centralized management interface together with on-prem data. And all is done with minimal disruption, thanks to the software-based design and virtual appliances. From AWS to Azure, from on-prem private clouds to public infrastructure, the Men & Mice Suite brings a holistic approach to network core management in the age of cloud. Its simplified operations workflow cuts out hidden costs and creates a single reliable management layer for DNS, DHCP, and IPAM. 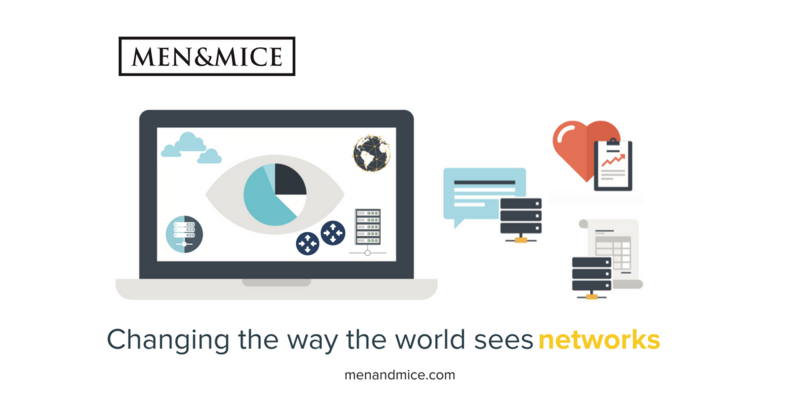 In short, Men & Mice Suite lets you scale your network to suit YOUR needs and we’ll focus on providing you with the management capabilities and visibility, no matter what’s under the network hood and how it changes over time. In our next post, we take a look at day-to-day network core management of IP infrastructure, and how we make that simple and straightforward as well. Already a customer of Men & Mice Suite? You can now share your experience through Peer Insights and G2Crowd! Microsoft's push for a global Azure cloud has not gone unnoticed. We have integrated with Azure and Azure DNS, which is why we exhibited at MS Ignite and why meeting our customers and talking to attendees was validating. Our solutions and development roadmap addresses their pain points in network management. As Yousef Khalidi on the Azure blog writes: "Customers continue to ask for better ways to connect to the cloud, better protection of their cloud workloads, optimal application performance delivery, and more comprehensive monitoring services. Attendees at Ignite came with questions about migration to cloud environments. Enterprise businesses have invested significantly into on-premise networking and IT over the last two decades. Those investments are still precious. 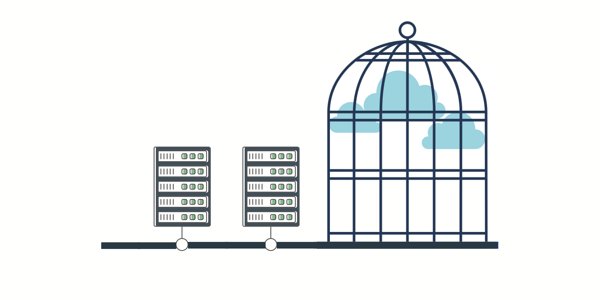 Migrating to a cloud platform can indeed seem a daunting - and expensive! - task. We offer a solution that bridges the visibility gap (and increases operational efficiencies) between on-prem and cloud. Customers looking to migrate select workloads onto the cloud can still manage and scale their network as if it was one. 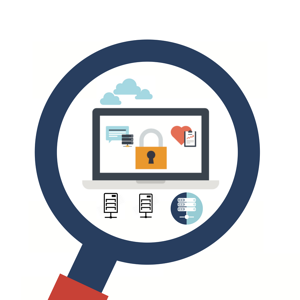 Security has always been a top priority in network management. And it is even more so, when heterogeneous environments share workloads with external cloud services. Cloud platforms like Azure have natively built-in redundancies and security guarantees, and the Men & Mice Suite takes advantage of those cloud-native features to deliver a holistic view across network environments. 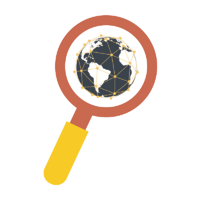 Our xDNS Redundancy™ streamlines the migration and management of large DNS zones to monitor and synchronize changes, for example. The Men & Mice Suite’s exceptional synergy with Active Directory (AD) was also well received. Customers can keep their on-prem configurations and access control intact and secure, save their previous investments in AD, synchronize and modernize their network management operations at the same time. It also enables access controls at the group and individual levels for greater security. We met a lot of network administrators and architects at Ignite who understood the value of non-disruptive deployment, and who were seeking solutions that can be integrated into their workflow unobtrusively. Our goal is to provide a layer of abstraction through which you can better understand your networks. The Men & Mice Suite's architecture is software-based and API-driven. Deployment poses no interruption to existing services, and the performance impact is nominal. The Men & Mice Suite gathers data from existing sources, and can control them, without overhead and performance impediments. Visibility in DDI provides a significant edge to businesses looking to optimize their resource use. We’ve always put that visibility front and center. With a single-pane-of-glass interface we've made network management simpler and more efficient. Customers can save time and money by viewing and managing network resources regardless of where they are or what platform they're using. Both the Men & Mice Suite and its recently improved web-based management application share the same affinity for simplicity and visibility. From customizable filters to automated reporting and alerts, your network is constantly under supervision. 'Ignite' means ‘start’ - where do we go from here? Attendees of Microsoft Ignite came from companies whose IT is largely or entirely based on Microsoft products. They’re naturally looking at Azure as a complementary service to their existing resources. (Or as a competitive alternative by itself.) Our long-standing integration with Microsoft’s networking products is carried over to extend to Azure’s cloud services as well. The aptly named event has been a great experience for us. In addition to meeting those who use technology and those who make technology happen in the business space, we’ve gathered feedback that both reinforced and expanded our development focus. We may have been in the DNS, DHCP, and IP Address Management business for decades, but as cloud services like Azure rise and network architects have to keep reinventing themselves, so do we. 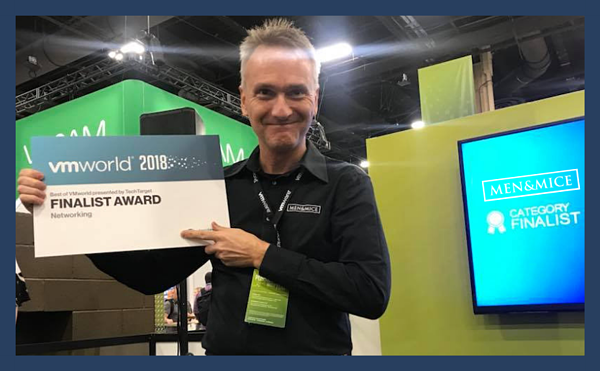 Fresh from the great experiences at VMWorld in Las Vegas — including a Finalist nod in the Networking category for the Best of VMworld Awards, thank you very much — the Men & Mice team is heading to Orlando, FL at the end of September, to talk all things Windows, Azure, hybrid DNS and IP address management at Microsoft Ignite 2018. Men & Mice was awarded as the Finalist in TechTarget’s ‘Best of VMworld 2018’ awards in the Networking category, and we couldn’t be more proud. 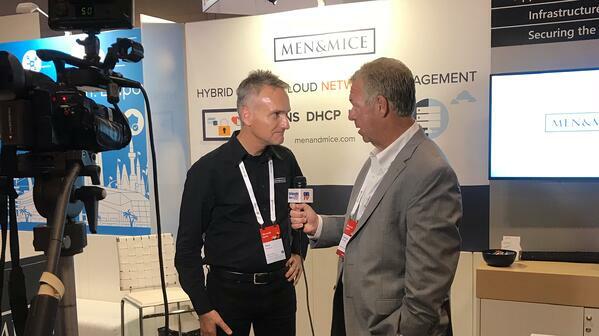 We brought the Men & Mice Suite to VMworld to showcase our no-nonsense, unified approach to simplifying enterprise DNS, DHCP and IP address management. Our commitment to developing software solutions that scale and adapt to changing network needs while keeping costs and complexity down (through automation, virtualization and full network visibility) were validated both in conversations we had at our booth and reflected in the award we received for Men & Mice Suite v9.1. The Men & Mice Suite is an overlay management solution that can be dropped on to an organization’s existing on-prem and cloud infrastructure, maximizing investments to give full visibility, synchronization and added security across network environments. Its fast-implementation and non-disruptive deployment, as well as reliable REST APIs, cloud-native functionality, fine-grained access controls and web-based management application simplifies day-to-day operations while amplifying compatibility with best-in-class platforms and vendors for greater network flexibility and portability as an enterprise network evolves. Microsoft Ignite is a prized opportunity not just for Microsoft, but for third-party developers, like Men & Mice, to connect with customers, partners (and each other) in order to advance Network technology further. The Men & Mice Suite was born amidst the rolling green hills of Iceland but feels right at home flying in the Azure skies of Microsoft (and on the ground in Windows Servers-based on-prem). Ignite will focus on cloud and networking (and cloud networking.) as dialog around cloud integration shifts from“if” to “how” and “how to make it better.” From datacenter modernization, and its fundamental transition to Managed Services, to cloud-native development for future-ready network infrastructure, Men & Mice will feel right at home. We are about simplified DNS, DHCP and IP address management, after all. 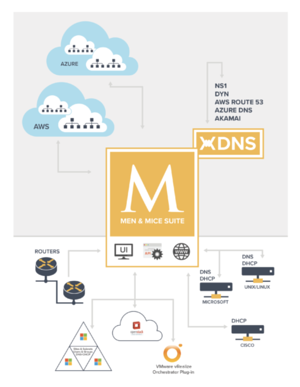 Men & Mice has been working closely with the Azure DNS team for a long time, to implement full support for Azure DNS in the Men & Mice Suite, an augmentation of the suite’s existing functionality with Windows-based on-prem environments, unparalleled Active Directory integration and hybrid IPAM synchronization with Azure cloud instances. 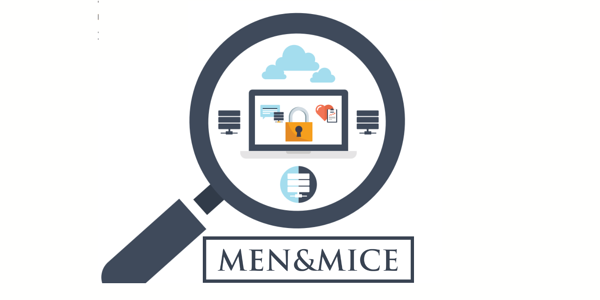 Men & Mice customers have been able to enjoy the same high availability, performance, and convenience of Azure DNS while maintaining the low cost and full control of their DNS domains and IP address blocks via the tools provided by the Men & Mice Suite. With the newest additions to the Men & Mice Suite v9.1, including xDNS Redundancy™, which includes cloud-native integration and support, full portability of DNS zones between on-prem, cloud and between cloud vendors, fully leveraging your resources has never been simpler and more efficient. With our web-based management application you can even take everyday network management on the go, while our APIs offer powerful automation (and more!). Drop by our booth to see how the Men & Mice Suite can increase network flexibility, scalability and simplify your Windows and Azure-based network management — including hybrid networks with on-prem Windows servers, IPAM in Azure and DNS on Azure DNS — without burdening administrators and end users with the complexities. Come meet us in Orlando to see for yourself. We’re returning to VMworld in Las Vegas, August 26-30 (Booth #2124, come say hi!) — and excited to not only see how our industry is evolving to virtualization and automation, but to also contribute our two cents to the dialog (Or 9.1 cents, as it were). Since the newly released Men & Mice Suite v9.1 offers highly scalable and efficient APIs that act as an abstraction layer to manage an organization’s whole DNS, DHCP and IP address infrastructure, across multiple vendors and cloud platforms, we’re focusing on two main tracks from the VMWorld agenda: Data Center and Cloud and Networking and Security, the first of which we’ll discuss in this post (the latter will appear in the next post). VMworld’s focus on integrated IT strategy plays nicely with the Men & Mice Suite v9.1 release (and our larger objectives as well). Men & Mice has been providing compatibility with VMware’s vRealize Orchestrator and vRealize Automation for years now. As the industry turns toward virtualization and cloud technology to build its next-generation, hyper-converged infrastructure in hybrid cloud environments, running cloud-native applications to cut costs and increase efficiency, so to have we adapted our Men & Mice Suite of DNS, DHCP and IPAM solutions to help organizations manage networks effectively and at scale. 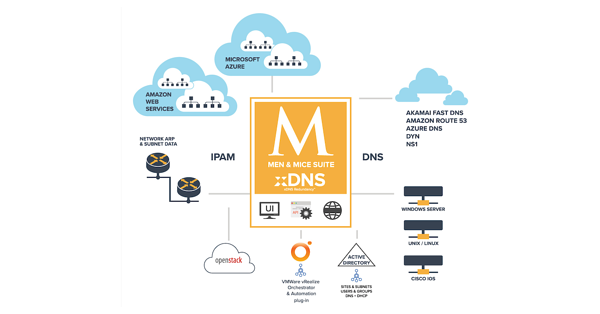 The Men & Mice Suite v9.1 supports Unix/Linux, Windows, and Cisco IOS and stretches into the cloud with functionality across Azure DNS, Amazon Route 53, Dyn, NS1 and Akamai Fast DNS, as well as IPAM in AWS, Azure and OpenStack. It can be dropped on top of an organization’s existing infrastructure to manage, sync and automate network changes, authorizations and provide comprehensive insight into large-scale networks through one unified dashboard. The Men & Mice Suite v9.1 supports thousands of concurrent users and API connections, with millions of managed IPs and DNS records, for automation and provisioning. We favor virtualization over physical appliances and platform-specific, custom hardware allocation. Turns out, our customers do too. We want our customers to be able to make the right choices for their network infrastructure (DDI) needs. Then, we offer our environment- and platform-agnostic Men & Mice Suite to help them manage it. Virtualized infrastructure is both cost and performance efficient. Men & Mice Suite gives organizations the flexibility and adaptability they need as every area of business operations goes digital, providing the managaibility and visibility needed for high-availability networks to be, well, highly available. Our new Men & Mice Suite v9.1, an overlay network management solution, offers many advantages for virtualizing and automating, as well as increasing visibility and ease-of-management of an enterprise organization’s network infrastructure, including its new web-based management application, which takes the “daunt” out of day-to-day operations and reporting. Another way we’re making virtualization easier is through the Men & Mice virtual appliances, the DNS software for which we’ve upgraded to BIND 9.11, supporting various new features as well as DNSTAP. For example, details on DNS queries received and DNS replies sent by the Men & Mice virtual appliances can now be logged for further processing by enabling and utilizing the powerful DNSTAP feature with minimal performance impact on the appliances. They can also function as NTP (Network Time Protocol) servers and be served by the same network infrastructure as DNS and DHCP. Every cloud vendor is different. Different platforms and configurations offer different advantages (and drawbacks) for customers. They also offer very different, and often incompatible APIs. Men & Mice Suite v9.1 services complex enterprise hybrid and multi-cloud networks by providing single-pane-of-glass visibility and cross-platform functionality for DNS, DHCP and IPAM (DDI) operations, whose networks use either multiple cloud (cloud native) vendors or a combination of on-prem and cloud (hybrid). The ability to bulk migrate DNS zones and DHCP scopes, ability to implement role-based authorizations, as well as providing 3 management interfaces (Windows-based management console, web-based management application and REST, SOAP and JSON-RPC APIs), the Men & Mice Suite v9.1 overlay software solution eliminates many of the complexities of today's large-scale networks while mitigating DNS failures such as configuration errors and DDoS attacks. Further, Men & Mice Suite's xDNS Redundancy provides a level of abstraction that builds automation, provides centralized views, eliminates human error and removes conflicting DNS service provider platform complexities (e.g. incompatible APIs). The Men & Mice Suite v9.1 also allows organizations to add Active Directory zones to xDNS groups. This, tied with the read-only members of xDNS groups, makes it easy for organizations to bring their internal, on-premises DNS into their virtual private clouds, and vice versa. Cloud operations monitoring, a topic to which we’re looking greatly forward discussing at VMworld, is transparent and easy in the Men & Mice Suite v9.1. 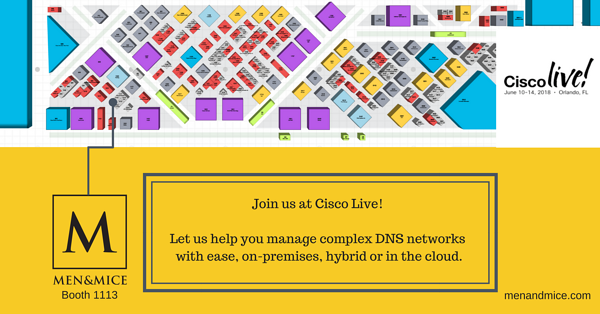 Not only have we integrated true cloud DNS into the Men & Mice Suite, but we also paid attention to the cloud-unique challenges it brings with it. Topics: DDI, Men & Mice, DNS, DHCP, API, VMware, Redundant DNS, DNS redundancy, DDoS, networking best practices, IP address management, hybrid cloud, hybrid network, "cloud dns"
The Men & Mice Suite version 9.1, released last week, introduced several new features and improved functionality for hybrid and multi-cloud networks. One of the additions we developed in our mission to change the way the world sees networks is a cross-platform, easy-to-use web-based management application. We intend the web-based management application for the Men & Mice Suite to be the go-to interface for the most common tasks. In the future, it will also serve as the central platform for our innovations across DNS, DHCP and IPAM (DDI). We're highly focused on developing an increasing number of partnerships to make integration across services and vendors even more seamless. With three major sections — DNS, Networks, and Reporting — the Men & Mice web-based management application is organized around operational efficiency. Where the existing Windows-based management console of the Men & Mice Suite gives you the full range of configuration and management options for your networks, the web-based management application focuses on day-to-day tasks, such as finding and working with DNS zones or records, IP address ranges, DHCP scopes and IP addresses. You may want to use the full Men & Mice Suite application for the yearly inspection or the large restructuring of your networks, but can quickly get things done from anywhere, on any device, with the web application. Another way the web-based management application helps to efficiently manage networks is through its Quick Commands feature. If you ever used the Spotlight functionality in MacOS or the universal search bar in other platforms or services, you know how a deceptively simple function can save incredible amounts of time. The Quick Command feature interacts with a single click or key combination (ctrl+space) and uses auto-complete to arrive at the needed information or function in just a few keystrokes. We’ll continue to focus on and add functionality to Quick Commands in future releases. As it gets smarter, so to will your network management get easier. Visit the Men & Mice Suite web-based management console guide for more information on its capabilities and full functionality. In addition to our virtual DNS/DHCP appliances and Virtual DNS Caching appliances, in a larger context of network management, the v9.1 release of the Men & Mice Suite continues to forge its path towards greater network virtualization and automation. The Men & Mice Suite restores and significantly improves the unified network visibility usually forfeited in the process of virtualization, intuitively pulling data from critical network components and consolidating it in an easy-to-use UI with extensive centralized control and functionality. The Men & Mice Suite offers unrivalled integration with Microsoft Active Directory Sites and Subnets, combined with real-time synchronization across diverse server environments and distributed virtual and physical locations. The comprehensive built-in tracking and logging tools ensure the systematic keeping of records. It's important to know who made what change, when, where, and why. Transparency takes the sting out of the fast and dynamic change procedures that are the hallmarks of virtualized environments. 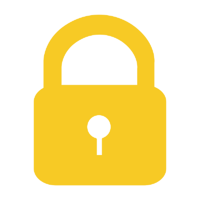 Access management is granular and fully integrated with Active Directory. Role-based access provides strong, centralized control and delegation. Different IT teams experience painless cooperation and efficiency, respecting the often hazy task boundaries created by the transformation from physical machines to virtual instances. The Men & Mice roadshow continues! What we do at Men & Mice is help companies with large, complex network infrastructure automate and virtualize their networks. We also believe in the value of other forms of networking-- meeting customers and future customers in person. We’ll be exhibiting at VMworld in Las Vegas August 26-30, to showcase the Men & Mice Suite at booth# 2124. We'll report in on our social media and on this blog — hope to see you either there!